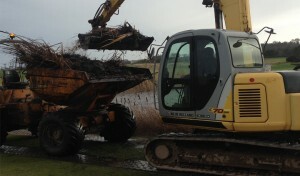 It’s mid December which means our greenkeeping teams are well underway with their winter maintenance programmes. 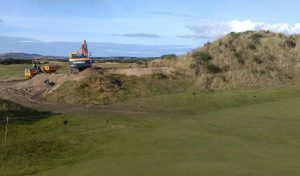 A major project on the New Course was the extension of the teeing complex on the 11th. Due to restricted space on the Medal/Championship tee, the past couple of years has seen heavy wear which affects the quality of surface. The objective of the work was to raise the tee to give the golfer more of an overall view of the hole and also to increase its width to twice the original size. This will allow for more teeing space which prevents wear and contributes to an overall healthier teeing surface. Our first step was to measure and mark out the size and height of the new tee, lift selected areas of turf that could be reused and remove the existing irrigation pipe and sprinklers. The remaining material was removed and placed in our soil compound where it will be used again for future projects. 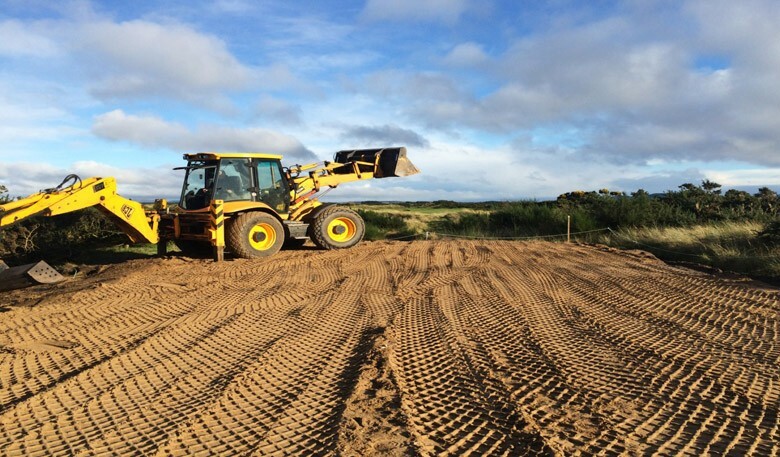 Our next job was to build up the foundation which meant driving in 100 tonnes of natural links sand – mostly from the 14th winter tee which was being removed. This fine sand material is ideal for drainage and is a consistent characteristic of our courses here at the Home of Golf. Once the foundation of the tee and bankings were complete the new irrigation pipes and sprinkers were reinstalled. 40 tonnes of rootzone was then laid. This consists of 70% sand and 30% soil and was applied to 5 inches in depth. This is the ideal soil structure for root development, retaining moisture and nutrients leading to a strong and healthy grass sward. The rootzone was then carefully hand raked to the desired marked levels and checked to ensure that the entire surface is consistently firm. Before the turf is laid we applied a granular (fertilizer) high in phosphorous to encourage root establishment. 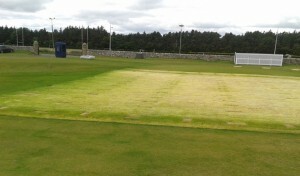 500m2 of turf was then laid, which was taken from our 7 hectare turf nursery. The turf is predominantly a fescue sward; a traditional links grass which is fine leaved and wear tolerant. It establishes quickly and requires minimal water and fertilizer management. One of the most important phases of any type of new construction is the aftercare. Rolling the turf with a lightweight pedestrian mower is the first stage which will help maintain smooth and level surfaces. The turf’s root establishment will be the next step and timing very much depends on soil/air temperatures and moisture availability over the next few weeks. Once a strong root structure and plant growth progresses, topdressing (with fine sand) by hand will be applied to maintain smoothness and firmness levels. Pedestrian mowing will then be implemented at a managed height of cut, adding definition to the outline of the tee and enhancing overall presentation. All of these practices will continue into early spring when we plan to reopen a strong and healthy teeing surface for the 2016 season. From all of the greenkeeping staff here at the Links, we’d like to wish you all a Merry Christmas and another fantastic golfing year in 2016.